According to a new Global Opportunity Report from DNV GL, Sustainia and the United Nations Global Compact, renewed efforts are required to ensure four of the 17 UN Sustainable Development Goals do not miss their 2030 targets. The Global Goals addressed in the report are Goal 10: Reduced Inequalities, Goal 12: Responsible Consumption and Production, Goal 13: Climate Action and Goal 14: Life Below Water. The solution-focused report — the fourth in its series — offers 10 new markets which could help get these Global Goals back on track, such as blockchain-based land rights for Goal 10 and energy-efficient cooling for Goal 13. 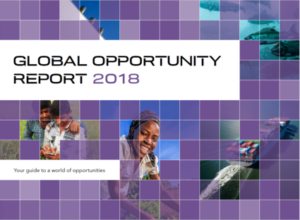 So far, the Global Opportunity Reports have identified 55 markets that demonstrate the business opportunities inherent in all of the 17 Sustainable Development Goals. The biggest opportunities can be found at the intersections of traditional markets, which requires collaboration and cooperation across sectors and fields. To facilitate that, the partners behind the report launched the Global Opportunity Explorer last year — an open access innovation hub with markets and solutions for the Global Goals. All 55 markets, including the 10 new opportunities, are now online on the platform. The Global Opportunity Explorer was created on the conviction that the Global Goals offer a myriad of business opportunities with great value to companies, society and the environment. The hub aims to showcase the best solutions and markets relating to the Global Goals and to foster collaboration and cooperation between investors, businesses and entrepreneurs. Since the inception of the Global Opportunity Report series in 2015, 17,000 business leaders have been consulted; and from their feedback, 55 market opportunities have been identified. The opportunities in the new report include securing land rights for the most disadvantaged through blockchain technology, re-purposing electric vehicle batteries for domestic power grids, and searching for alternative materials to energy-intensive concrete. Hey Buddy!, I found this information for you: "Ten new markets earmarked as opportunities to boost lagging Sustainable Development Goals". Here is the website link: https://www.duurzaam-ondernemen.nl/new-markets-earmarked-as-opportunities-to-boost-lagging-sustainable-development-goals/. Thank you.